Welcome to the on-line home of Nuisance Wildlife Control and Removal. We handle all forms of nuisance wildlife and provide raccoon removal, skunk removal, opossum removal, squirrel removal and bat removal. We provide effective solutions to all unwanted wildlife interactions. We handle nearly all aspects of wildlife control, and resolve conflicts between people and wildlife in a humane and professional manner. Our presence on your site is always handled in a discreet fashion. We strive to educate our clients on prevention of animal intrusions, which is much simpler and less aggravating than dealing with the problems after they occur. Just taking a few simple steps can help to prevent most of the common wildlife-related problems around your home. When it cannot be prevented, we can assist with animal removal. By Illinois law, an animal removal permit must be requested from the IDNR before most species of wildlife may be removed from private property. As an Illinois licensed nuisance wildlife control operator, we can provide effective, professional, discreet and humane removal of unwanted wildlife from your premises. Working with Jerry was a pleasure. He is very attentive, top notch communications and very professional. We had a sneaky, nuisance skunk that made Jerry tackle this job with determination. 100% success! Mr. Landry was great! He came to the house, assessed the situation, came up with a plan and had our pesky squirrel caught within a few hours. He was back out promptly to collect the critter and assured me that the squirrel would be humanely released into a safe environment far from our location. Killer raccoons from outer space safely removed from our home! Jerry and his team removed a mother raccoon and 3 babies from our chimney. They used a cage trap that they lowered into the chimney top to capture momma when she climbed up to forage for food. Then Jerry removed the babies from the smoke shelf of chimney. It is best to follow this sequence! Do NOT go for the babies first! Safe, effective, and humane. Jerry took the animals away so we cannot eat them. Other than that, he and his team knew what they were doing, solved our problem on a timely basis, and were first rate overall! Captured the Raccoons in 1 day. Out of my attic! Jerry came out on a Saturday after I had found a suspicious hole under the front stoop. He set a trap, explained it all and was very professional. Preaching patience was good as it took a week, but the possum was caught eight nights later. He covered the hole, said to wait a week if another decides to dig. So far, no new tenants. We were having trouble with some skunks that got in under our porch. Jerry came out the following morning and went right to work. He got the problem solved in a very short time frame without the house smelling like skunk. Could not be happier with the great service Jerry was quick to return calls or text messages. He would listen to our concerns and also offered sound advice to avoid future problems. I would highly recommend Jerry to anyone that has a wildlife problem Thanks again Jerry for the great job. Had a raccoon living under my deck. Jerry came out, set a trap and caught the raccoon the next day! Thanks Jerry! Successful skunk trapping and removal in S. Elgin IL. On going successful raccoon trapping and removal in Naperville , IL raccoon # 3 . Successful squirrel trapping and removal in Oakbrook , IL. Successful opposum trapping and removal in Naperville , IL. Successful mother raccoon trapped and removed from chimney . Successful baby raccoons removed from fireplace . 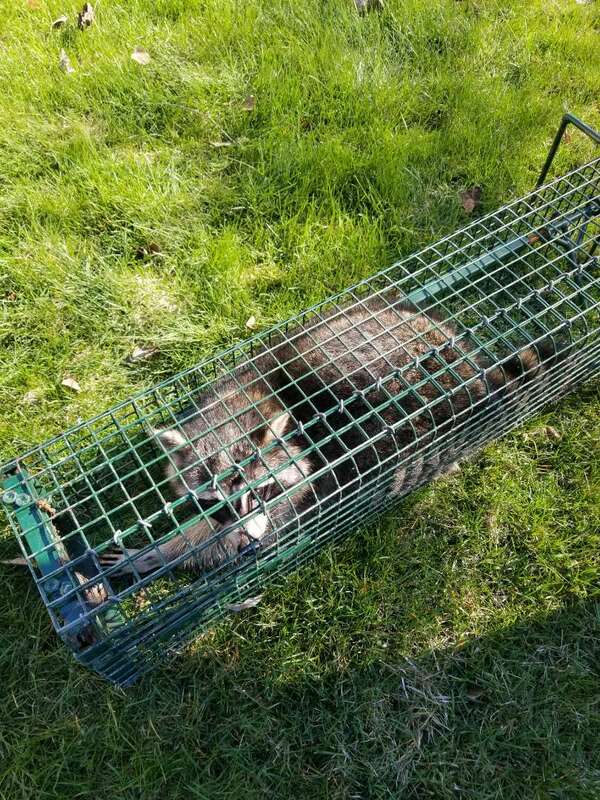 Successful raccoon trapping and removal in Naperville , IL. Professional skunk trapping and removal in Naperville , IL.